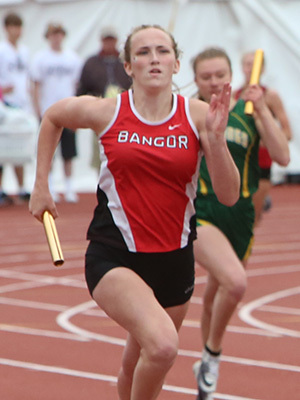 Bangor anchor Ashlie Lockington is shown overtaking the other anchors on the way to the Bangor 4x2 win [1:47.56]. 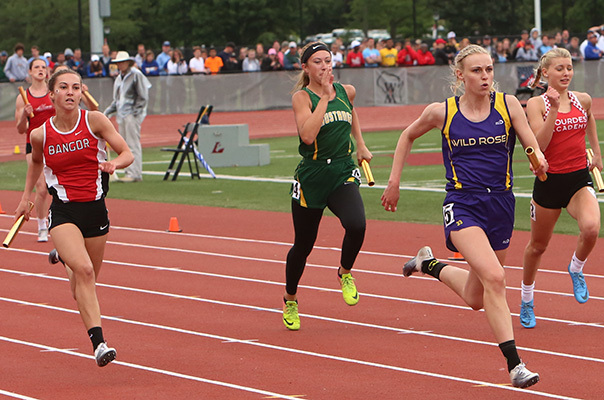 Wild Rose finished in 1:47.68, Lourdes Academy in 1:47.99, and Melrose-Mindoro [green jersey] in 1:48.01. 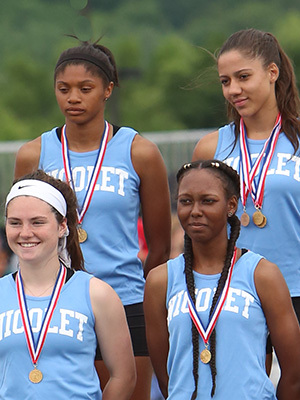 Hilbert/Stockbridge posted a 4:05.96 to win the Gold Medal in the 4x4. 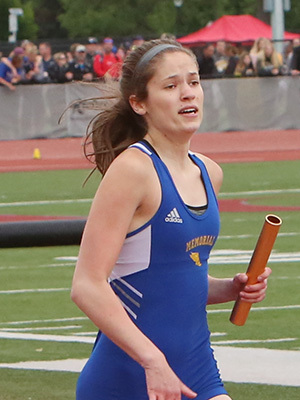 Megan Lau moved Hilbert from 5th place to 4th place on her lap before Makaylee Kuhn turned on the jets to finish about 1/2 second ahead of second place Auburndale. The Hilbert/Stockbridge 4x8 also won the Gold Medal with a time of 9:47.72. 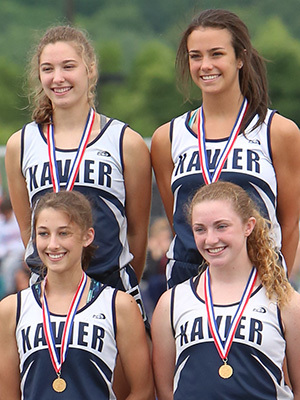 Xavier claimed the Gold Medal in the D2 4x100m relay with a time of 48.87. Berlin's Isabelle Hainz and Paige Krause, and Bloomer's Vanessa Jenneman and Grace Post. 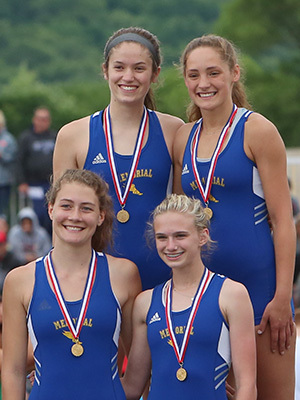 At the 2016 State Meet the quartet above set a D2 record in the 4x400m with a time of 3:56.66. 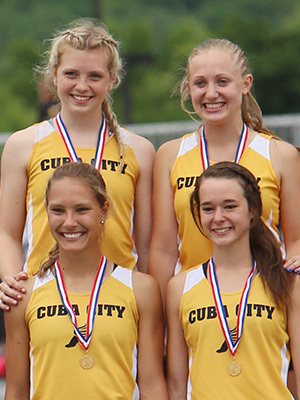 Now back for their final State meet the senior 4x4 established a new record with a time of 3:54.94. At the 2017 State Meet Edgewood finished second to East Troy in the 4x8 race. 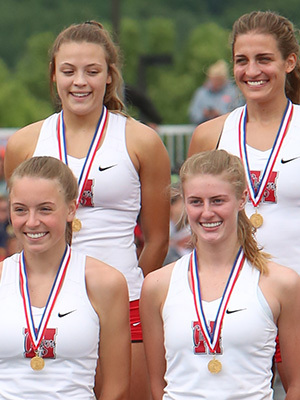 This season Edgewood won the Gold Medal [9:25.40].with East Troy gaining the Silver Medal [9:30.28]. 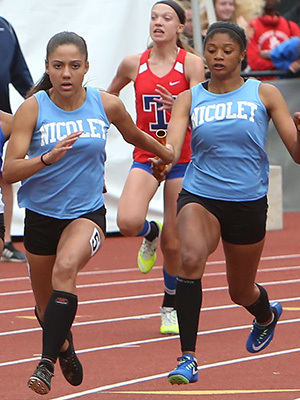 Nicolet set a school Record [47.91] in winning the D1 4x100m relay event. Hamilton's Amanda Hammond and Megan Jansett, and Oak Creek's Maddie Gard and Katie Gard. 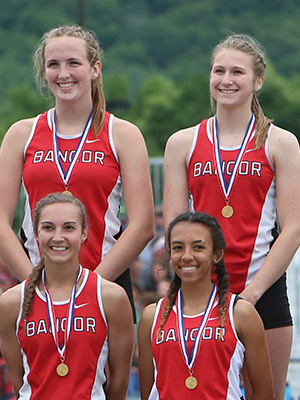 Kynnedi Malone, Destiny Huven, Victoria Borum, and Josie Kelderman. Left: Leg 2 Hamilton runner: Amanda Hammond. 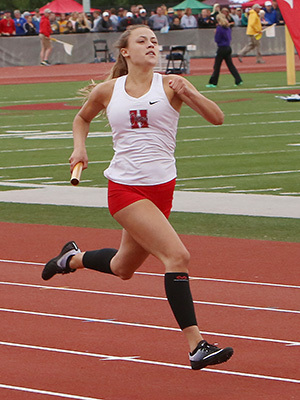 Arrowhead anchor Kayla Vogt was in third place on the final exchange in the 4x4.Vogt edged ahead in the final 30 meters as Arrowhead claimed the Gold Medal. 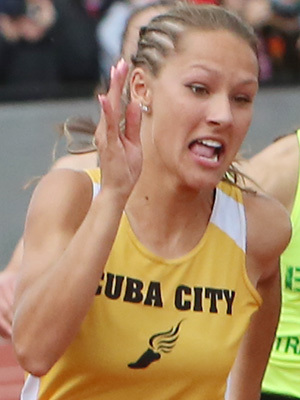 Arrowhead was timed in 3:55.42, 2nd place Waukesha West in 3:55.76 and third place Hamilton in 3:55.94. 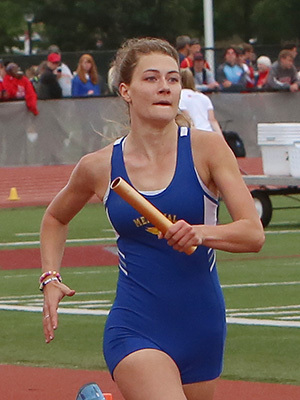 The Wolverines from Waukesha West opened the State Meet with a win in the 4x800m relay [9:09.54]. 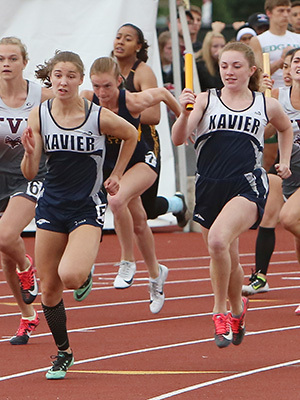 Their time was the fifth best Top 50 All -Time performanmce in the 4x8. 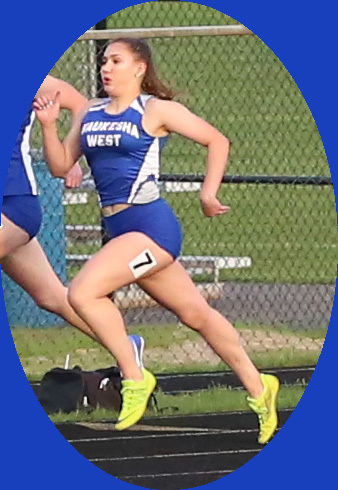 In addition three of the runners above were on the West 4x4 which placed 2nd in the final event of the meet. 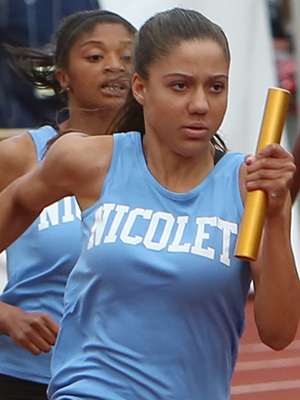 That place gave them enough points to overtake two time defending Champion Milwaukee Rufus King 38 to 35 for the team championship of the State Meet. Maddie Frey, Brooke Studnicki, Brooke Lytle, and anchor Becca Langer. 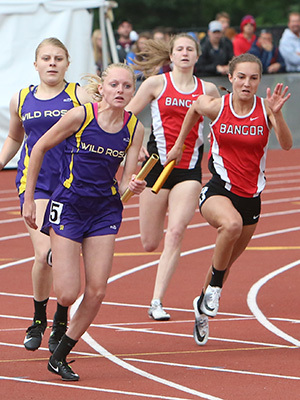 Langer, Lytle and Frey also ran on the 2nd place 4x4 along with ninth grader Ellie Richmond.